Grill Season Is Here! 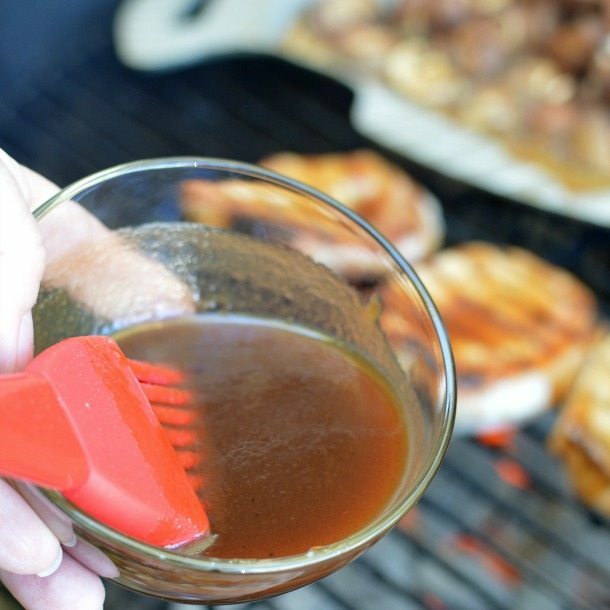 Homemade Barbecue Sauce is a great way to get creative with your grill recipes. This unique Sweet and Sour Barbecue Sauce Recipe requires only 4 ingredients! 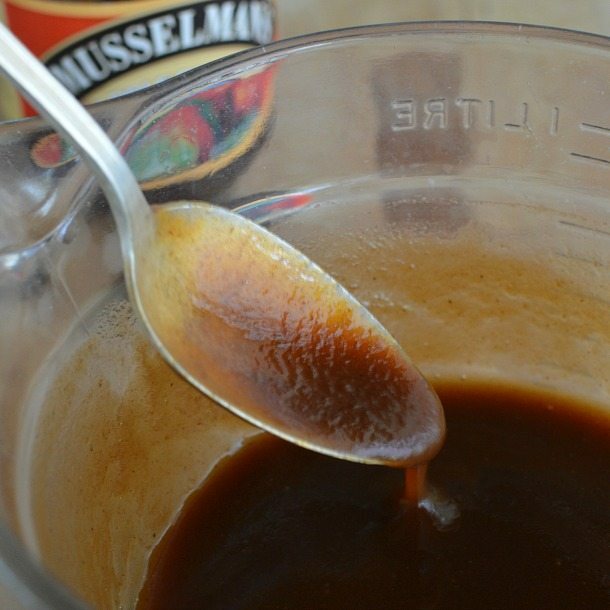 To make an interesting barbecue sauce, I used Musselman’s Apple Butter and the flavors of Sweet and Sour Sauce. I received a Musselman’s Apple Butter kit that included a Wilton Armetale grill pan. Guess What . 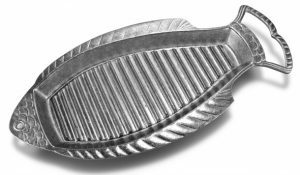 . . You have a chance to WIN your own Musselman’s Apple Butter Grill Kit! Enter the giveaway below. This sauce is sweet, tangy and bursting with flavor! Just mix 4 simple ingredients and slather it on meat or vegetables. I decided to get my grill on with mushrooms and chops. 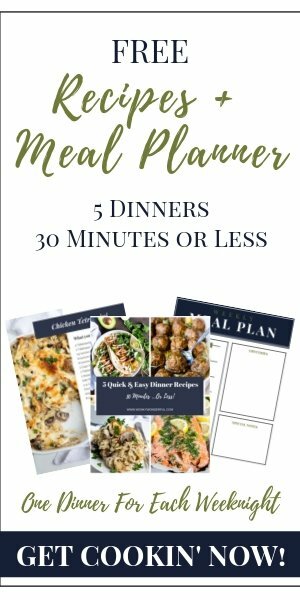 But, feel free to use your favorite vegetables and protein. This sauce will be fantastic on chicken too! 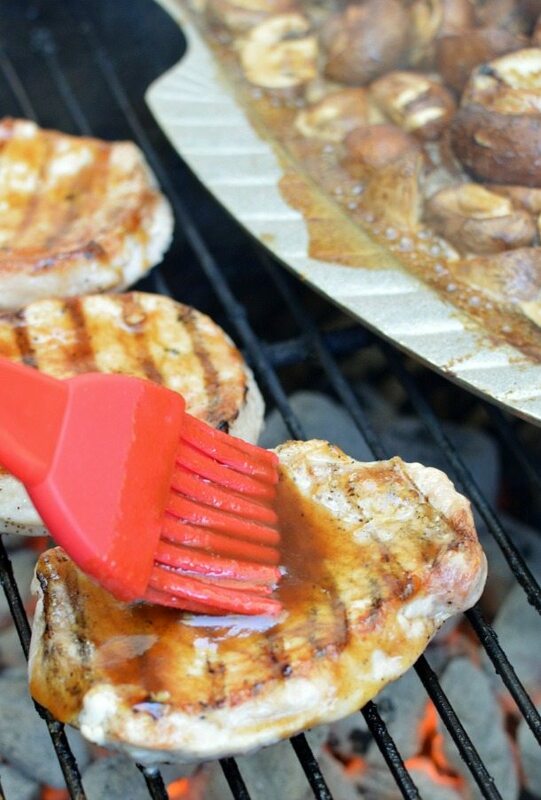 The Wilton Armetale Fish Griller pan was perfect for grilling my Sweet and Sour Barbecue Mushrooms. 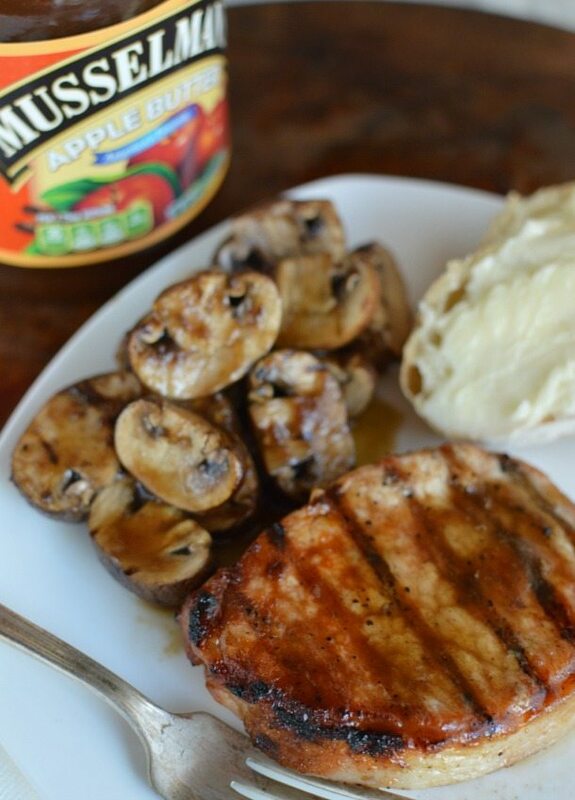 The mushrooms were infused with all that great smoky flavor while the pork chops did their thing on the grill. Like I said, slather on that sauce! Truthfully, I am not a grill master. I am much more comfortable in the kitchen. I decided that I will be working on my grill skills this summer. Is there anything better than the smell of barbecue on a hot summer day with the distant rig-a-ling of the ice cream truck a few streets over? Nope. Mix all ingredients together until fully incorporated. Makes approximately 1¼ cup sauce. 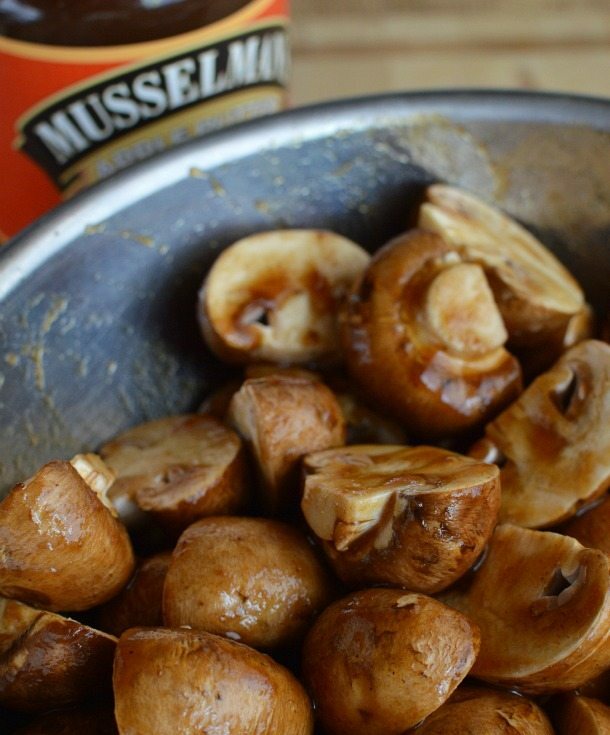 Coat mushrooms with 3/4 cup barbecue sauce. Transfer to greased grill pan. Place grill pan on prepped grill (on indirect heat) with top closed. Allow to cook for 15 minutes. Evenly coat pork chops with olive oil, salt and pepper. 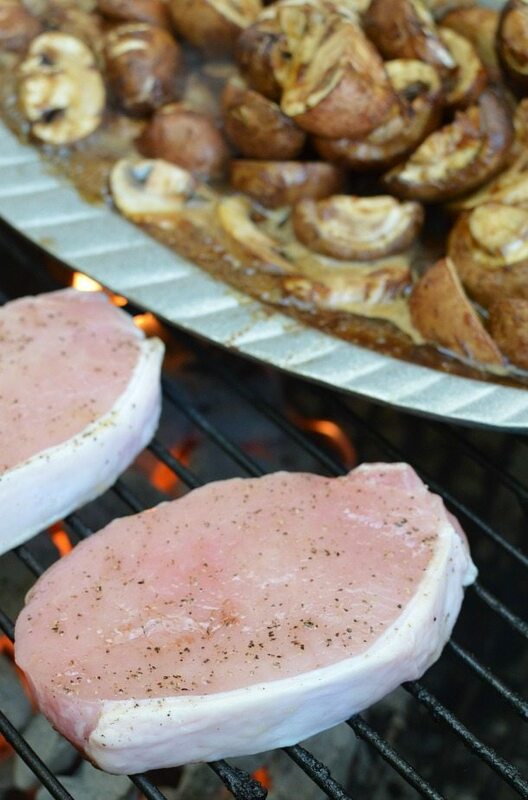 After mushrooms have been cooking for 15 minutes, place chops directly onto grill. Heat for 3-5 minutes. Flip, slather on barbecue sauce and cook for 3-5 more minutes. 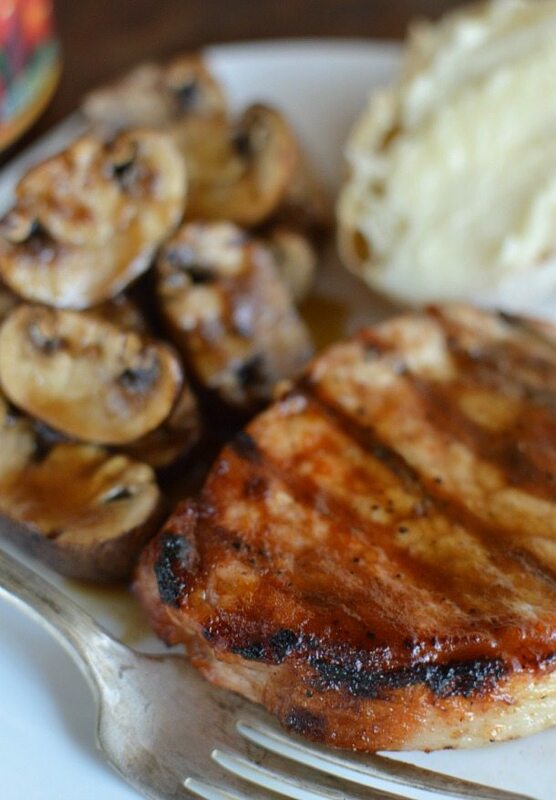 Once pork chops are cooked through, remove chops and shrooms from grill. Serve. **Open to US Residents Only** Good Luck! My favorite thing to grill is brats! Yum! The sauce sounds like it will be so yummy. Can’t wait to try it on my pork chops! This sauce sounds great. I love grilling fish and veggies, as well as fruit. Wow, this looks awesome, Nicole! I’d say your grill skillz are pretty darned good already. 🙂 I love that pic where you are holding the sauce over the grill! And as far as grilling goes, pretty much anything and everything…but I do love a good #cheeseburger! This sauce looks AMAZING, Nicole! My favorite thing to grill is actually simple corn on the cob.. which I then schmear with butter and Parmesan cheese! Mmmm, grilled corn on the cob is Awesome! I love to grill ribs!